*Crossover/SUV Touring All-Season light truck tires are for drivers who want a combination of sophisticated low-profile tires/large rim diameter wheels to enhance their vehicle's appearance with all-season versatility, including traction in light snow. 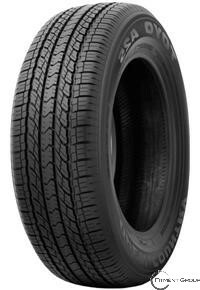 *Crossover/SUV Touring All-Season tires branded with the M+S symbol are sometimes used as Original Equipment (O.E.) on 2WD and 4WD light- and medium-duty crossover and sport utility vehicles. *O.E. Crossover/SUV Touring All-Season light truck tires are typically purchased as direct replacements for worn-out pairs/sets of the vehicle's original tires. They can also be used for other vehicle applications in complete sets of four or axle pairs if available in an appropriate size, load range and speed rating to match the existing O.E. tires' performance category and specifications.